This bed has crab shell and coffee grounds. Both are waste products that I picked up last summer using my bicycle and trailer. Also buried within are autumn leaves. 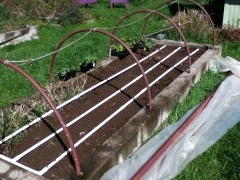 Last weekend we covered the bed with a plastic tent over pvc hoops to dry out the soil. Today a 3 hour break in the storm served as our chance to get this first bed planted. 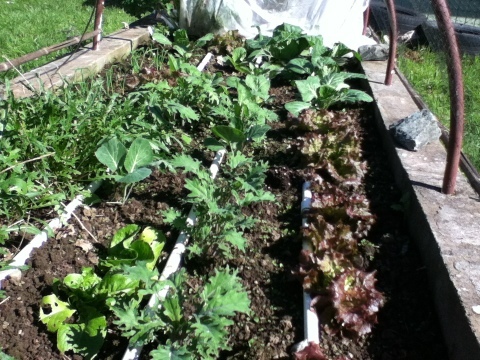 A floating row cover will be placed over the cabbages to protect them from the cabbage moth and cabbage fly, then netting to keep out the deer, followed by the plastic film tent to protect them from the high winds and driving rain from the next set of storms. March came in like a lamb and is going out like a lion.